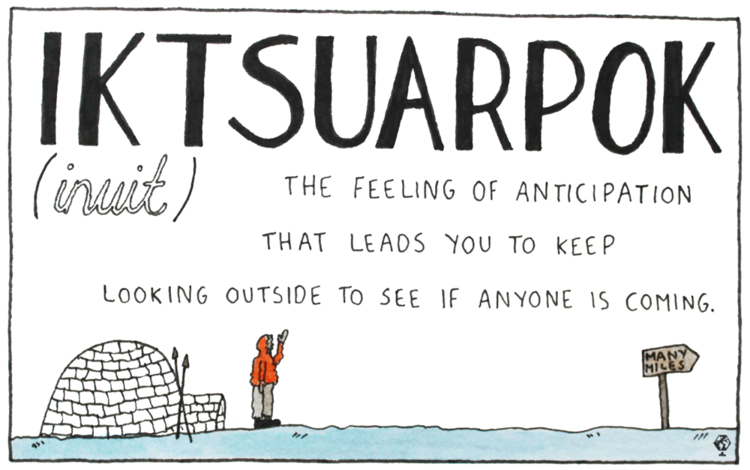 A while back, I stumbled upon a wonderful roundup of 11 untranslatable words on the travel site Maptia. My favorite was the German word waldeinsamkeit, which roughly translates to “the feeling of being alone in the woods” — though the Italian culacchino, “the mark left on a table by a cold glass” — has also come in handy. The author and illustrator of the post, Elle Frances Sanders, recently published a book that expands and extends on the original post: there are 52 words this time, each with whimsical watercolor illustrations. Sanders does not dig into the etymology of the words, though in many cases, they are compounds, and not necessarily etymologically interesting. She also doesn’t dig into the historical context of the words (there are a number of Dutch and German words around the concepts of shame and apologies and putting one’s head in the sand). However, Lost in Translation is a fantastic leaping off point. My only real criticism is that Sanders draws from relatively few languages (there are many Scandinavian words, and two Swedish words devoted to coffee, but only one word from Southeast Asia, very few from Africa, and none at all from North America). Anyways, that criticism is really a bit of a compliment — I want more words! Please do check out Lost in Translation; my mother bought my copy, but it’s also available on Amazon and hopefully in yo’ local shop around the corner.